Lärarfortbildning was about to launch a leadership initiative and wanted a name that communicated something entirely new. They turned to Eqvarium who helped them choose Spirado, a unique name loaded to the brim with just the right feeling. – In our industry we normally use descriptive names and simply call things what they are. Our own name is a prime example of that. We had previously organized a conference called “Preschool Manager”. 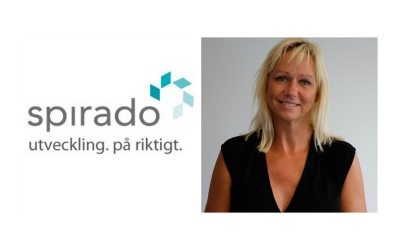 Now that we had developed a completely new concept, based on the idea to create a competence network for preschool managers, it also seemed right to think innovatively around the name, says Anna-Karin Lindberg, marketing manager at Lärarfortbildning. Was there any particular reason why it was important to have a unique name for this particular product? – We target an audience that is important to us and we wanted a name that would exude quality. The idea was that it could serve as an umbrella for all products that especially target managers. Describe the collaboration with Eqvarium. – Katarina led a process to clarify what sort of name would suit us the best, and what values we wanted it to communicate. We developed a wide range of categories, including joy and energy, leadership and development. Katarina later presented a number of alternative names attached to each group. From a certain system we got to select various options to finally come up with the name we considered the best. How did you feel about the process? – We felt that it was extremely safe to work with Katarina. She did a great job behind the scenes and the trip was very comfortable for us. None of us had been involved in developing a name before, but everything still went smoothly. And of course, we got very good name. The group decided to go with the name Spirado. What is it that makes that name just right? – We think it sounds very good gives the right associations. Spirare, which means breathe, and ado as in Eldorado, create associations with joy and energy. You can also think of it as growing through sprouting in Swedish. Preschool managers find a positive spiral and grow with us! What reactions have you received so far on the name? – Only positive, and we are very happy that we dared to choose a name that stands out. The name is really loaded with just the right things, and it gives energy and inspiration in the further development of this leadership initiative.